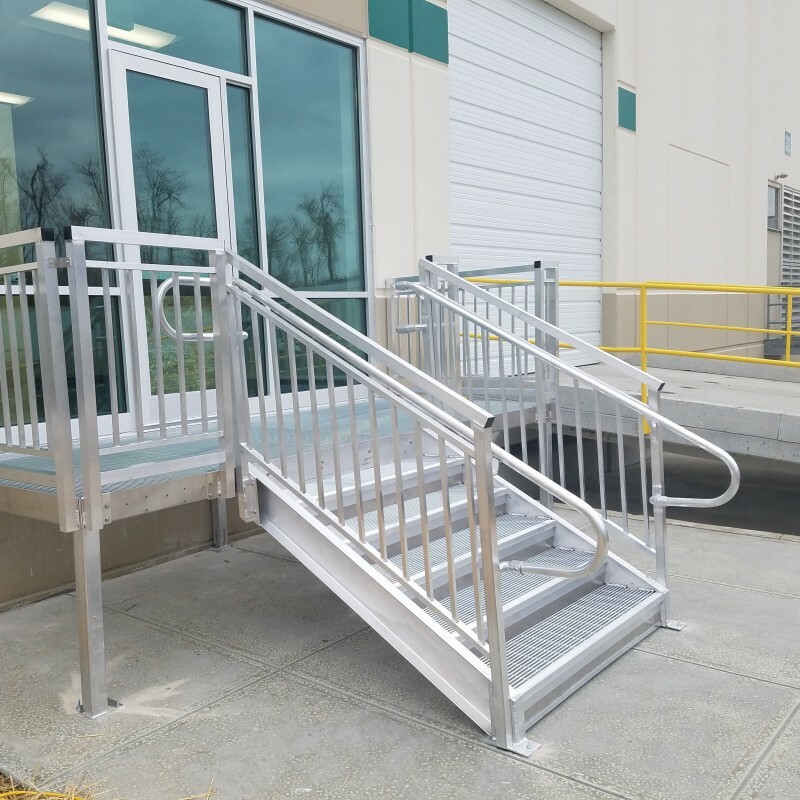 These outdoor warehouse steps are made from concrete and painted, galvanized steel, which is a common type of step for an outdoor application. However, after just a few years, the steps have deteriorated and need to be replaced. Why and how do they deteriorate so quickly? Why does it crack? The cracks are most likely a result of heaving. Heaving cracks are from cycles of freezing and thawing that cause the concrete to contract and expand. The expanding concrete is pushing the metal nosings away from the frame. This warped metal produces a tripping hazard along with workers compensation opportunities. Rust is another name for iron oxide. The process of oxidation occurs when a metal reacts with oxygen in the presence of water or moisture in the air. Given enough time and exposure to oxygen and water, any iron mass will convert to rust and disintegrate. The life of the product can be prolonged by galvanizing the metal which provides a protective layer of metallic zinc. However, galvanization often fails at seams, holes, and joints where there are gaps in the coatings. Therefore, galvanization provides protection for only a limited period of time. The chipped paint is most likely due to age, which is unavoidable. As time goes on, the cohesive bond strength continues to develop. Cohesion, in laymen’s terms, means that the paint particles are sticking to each other better and better over time. Therefore, the cohesive bond strength can overwhelm the adhesive strength of the coating to the metal. 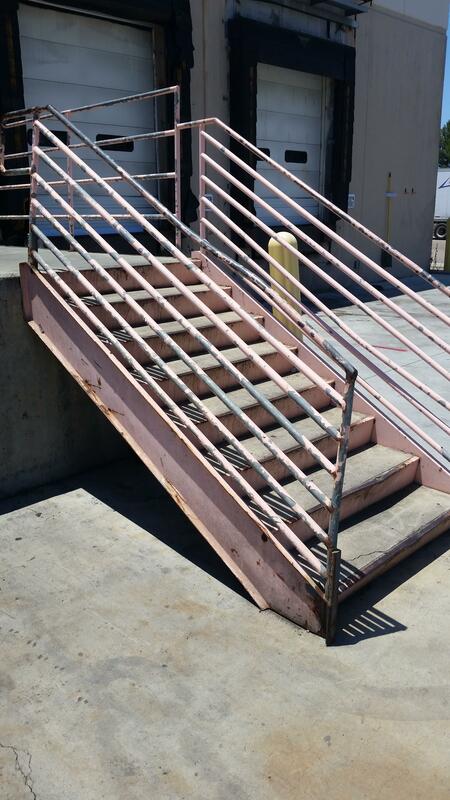 The steps are no longer compliant with OSHA regulations since the concrete and metal have created uneven step treads along with large “lumps” in the tread nosing. 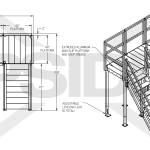 ADA-compliance is typically necessary for loading dock steps because non-affiliated delivery workers may use the steps to drop off small loads. Since the stairs are used by non-employees, ADA regulations must be followed. Aluminum oxidizes when exposed to oxygen and moisture, but the result is not rust. Oxidation on aluminum actually strengthens the material instead of deteriorating it. This means that over time, aluminum becomes stronger. The powder coating is typically applied electrostatically and then cured under heat. This makes the coating form a “skin” that is much less likely to experience the cohesion and chipping that paint experiences. 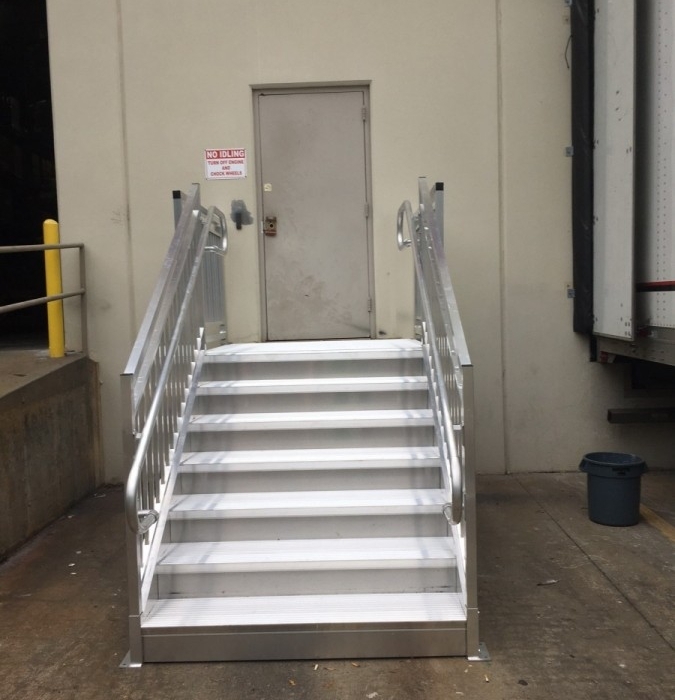 For a loading dock application, ADA-compliant warehouse steps are usually required. 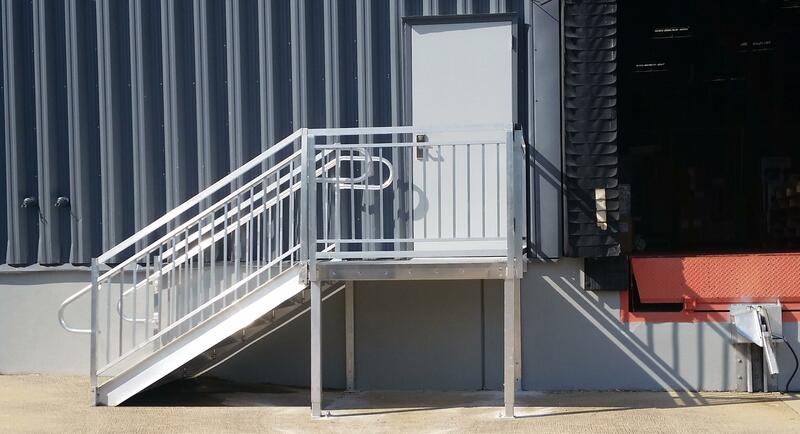 All of Upside’s loading dock steps are compliant with the latest ADA regulation. If ADA is not required for the application, the OSHA-compliant step is available.